Flor Aceff-Sánchez obtained the Professor of Primary Education degree at the Escuela Nacional de Maestros in 1982. In 1989 obtained her undergraduate degree in Mathematics, in 1990 graduated as Master in Mathematics and obtained a Ph.D. in Mathematics in 1995 at the Faculty of Sciences of the Universidad Nacional Autónoma de México. She is currently Full Time Professor at the Faculty of Sciences of the Universidad Nacional Autónoma de México both in Professional and Posgraduate Studies. She was National Researcher (1995-1998). She is member of various scientific associations such as: the Mexican Institute of Sciences and Humanities, the Royal Spanish Mathematical Society, the American Mathematical Society, the Mexican Society of Geography and Statistics, the Mathematical Society of Mexico and is president of the Council on Accreditation of Educational Programs in Mathematics. Octavio Alberto Agustín Aquino studied his undergraduate degree in Applied Mathematics at the Universidad Tecnológica de la Mixteca in Huajuapan de León, Oaxaca, and the Masters in Mathematical Sciences at the Universidad Nacional Autónoma de México. He obtained his Ph.D. in 2011 at the Universidad Nacional Autónoma de México under the joint direction of Emilio Lluis-Puebla, Guerino Mazzola and Rodolfo San Agustín Chi. His research is aimed at extending the Mathematical Theory of Counterpoint developed by Guerino Mazzola. Janine du Plessis is originally from South Africa and did her undergraduate and Masters in Mathematics at Georgia State University, where she wrote her thesis under the direction of Mariana Montiel. She also studied Music at the same University. She presently teaches Mathematics at Georgia Perimeter College and Chattahoochee Technical College. Emilio Lluis-Puebla completed his Professional and Master Studies in Mathematics in Mexico. In 1980 he obtained his Ph.D. in Mathematics in Canada. He is professor at the National Autonomous University of Mexico in their Professional and Graduate divisions for over thirty years. He has formed several professors and researchers who work in Mexico and abroad. His mathematical work has been established in his research articles published on Algebraic K-theory and Cohomology of Groups in the most prestigious national and international journals. He has been Visiting Professor in Canada. He received several academic awards, among others, Gabino Barreda Medal for the highest average in the Masters, National Researcher (1984-1990) and Endowed Chair of Excellence Conacyt (1992-1993). He is the author of several books on Algebraic K-Theory, Homological Algebra, Linear Algebra and Mathematical Music Theory published worldwide by Addison Wesley, Springer Verlag, Birkhäuser, AMS, SMM, among others. He is a member of several scientific associations such as the Royal Spanish Mathematical Society and the American Mathematical Society. He is president of the Academy of Sciences of the Mexican Institute of Sciences and Humanities, president of the Academy of Mathematics of the Mexican Society of Geography and Statistics and president 2000-2002 of the Mathematical Society of Mexico. Mariana Montiel did her undergraduate and Masters in Mathematics at the National Autonomous University of Mexico. In 2005 she obtained her Ph.D. in Mathematics in the United States. She is professor at Georgia State University, in the Department of Mathematics and Statistics, since 2006. Her research is focused on Mathematical Music Theory and Mathematics as a semiotic system, with emphasis in the aspect of language. 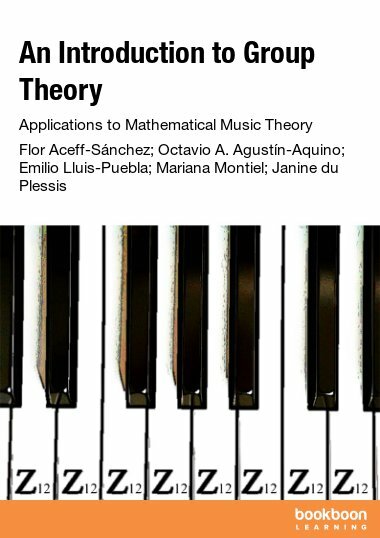 She has directed theses and research projects in Mexico and the United States in the area of Mathematical Music Theory. She has published articles and collaborated in books about the application of Category Theory to Mathematical Music Theory. She has received several scholarships and grants from foundations and institutes in Mexico and the United States, such as the National Council of Science and Technology, The UNAM Foundation, the University of New Hampshire and the Research Foundation of Georgia State University. She collaborates internationally and does translations of articles on Mathematics and Mathematics Education. Some of her publications are found in Birkhäuser and Springer Verlag.